Lykle de Vries | My Christmas-message to you: The. ClueTrain. Manifesto. My Christmas-message to you: The. ClueTrain. Manifesto. 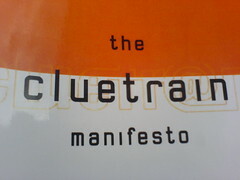 I only read The Cluetrain Manifesto when it already was old (especially in internet-years), but now it has been refreshed. And the honest, shocking truth is that this book is as relevant today as it was in 1999, when it was first published. This remains the one single most relevant piece of advice I can give to anyone who wants to ‘get’ social media: read The Cluetrain Manifesto. So, if you’re serious about making a difference, about adding value to this world, if you want to create the best, most powerful and energizing service/product ever: READ. THE. DAMN. BOOK. Have a wonderful Christmas, make a difference in 2010!